Over fifty summers have come and gone since the summer of 1964 in Mississippi. That summer over a 1,000 mostly young people rode down to Mississippi to help disenfranchised Blacks register to vote. And my friend Carl Se-Keung Imiola Young was one of them. Carl who? You ask. In American schools the first two months of the year are dedicated to Dr. Martin Luther King, Jr and the Civil Rights Movement as if Dr. King was a one man band. Or, as Julian Bond summed it up so succinctly, "Rosa sat so Martin could march so Obama could run." Every little child writes an essay about "I have a dream". Not once giving a thought to the bravery of hundreds of thousands of "ordinary men, women, boys and girls doing unordinary things to make the dream happen. "For us, the Movement we participated in was above all a mass peoples' movement — people coming together to make history for themselves". Bruce Hartford wrote, "What was most fundamental and profound in that struggle was the central role played by men and women, boys and girls, transforming their own lives for themselves through extraordinary courage. For us, these non-famous folk who are overlooked or undervalued by mainstream history were the heart & soul, blood & bone of the Freedom Movement. Of course, you are not familiar with the well over 1,000 out-of-state volunteers participated in Freedom Summer alongside thousands of black Mississippians. Most of the volunteers were young, most of them from the North, 90 percent were white, many were Jewish and Carl Se-Keung Imiola Young, an ethnic Chinese student from Honolulu. People often talk about change. They talk the talk, but when it comes down to it.... they are still talking. Carl was brave, and capable of making extraordinary change throughout his far too short time on this planet. While a senior at Carleton College in Minnesota Carl took part in the massive "March on Washington". He also made a three-week 2,500 mile hitchhiking tour of the South, either moderated or spoke on civil rights at several colleges' student gatherings. Immediately after graduation, with a degree in government and political science Carl, announced that he intended to go to Mississippi after a week of training in Cincinnati. Carl wrote a letter to his family church in Honolulu for financial and moral backing. In the letter to his pastor, the Reverend Richard Wong, he stated that all workers have been warned about the great possibility of arrest so they should have bail money. "I will do my best to keep from being arrested, but I will remain to stand trial in order to prevent forfeiture of the bond ..." the bond is very large. He said the bond usually runs around $500. "I feel a moral obligation to direct action to help resolve America's greatest domestic problem, and since I am in a position to do so, I'm asking the support of you and the church". He went on to explain, "Since I have been away from the isolation of Hawaii, I have gradually been caught up in the movement." Hung Wai Ching, chairman of the church council told the congregation that the council was ready to donate $220 for Carl's living expenses while in Mississippi and also the bail money. The highly respected Hung Wai Ching; a community leader, told the council should they want to share in the spirit in Carl's work, each person should contribute toward Carl's expenses. The goal was met within the week. In the late summer of 2004 upon his return from "The 2004 Voices of Freedom Summer National Conference and Reunion", Carl, a veteran of the SNCC (the Student Nonviolent Coordinating Committee) told me about that agonizing summer. "I had read the brochure and thought this was where I had to be. It read "This summer, SNCC, in cooperation with COFO, is launching a massive Peace Corps-type operation in Mississippi." The promise of the Peace Corp appealed to me." So I decided to go. Carl said. The Council of Federated Organizations (COFO) was a coalition of the major Civil Rights Movement organizations operating in Mississippi. COFO member organizations included the National Association for the Advancement of Colored People (NAACP), Congress of Racial Equality (CORE) Southern Christian Leadership Conference (SCLC) and the Student Nonviolent Coordinating Committee (SNCC). COFO was formed in 1962 to coordinate and unite voter registration and other civil rights activities in the state and oversee the distribution of funds from the "Voter Education Project". Two one-week orientation sessions for the volunteers were held at Western College for Women in Oxford, Ohio, from June 14 to June 27, 1964. After the training that all volunteers had to go thru it was announced that James Chaney (a black CORE activist from Mississippi), Andrew Goodman (a summer volunteer), and Michael Schwerner (a CORE organizer) — both Jews from New York were murdered in Philadelphia, Mississippi. Their training supervisor asked anyone who wanted to dropout. No one did. Going to Mississippi in the summer of 1964 to join the civil rights movement, Carl knew he was putting himself into harm's way. He went anyway. Carl looked at me with a broad grim and said, "But I did sign my will". "In 1964 I spent the summer in Holly Springs as a COFO (The Council of Federated Organizations) safety/communications officer; there was no sovereignty/independence movement in Hawai'i. A humid subtropical climate, the tiny town of Holly Springs is near the Mississippi Delta, the area was a series of cotton plantations, which depended on slave labor. The racial makeup of the city was about 22% White, 77% African American, therefore the white establishment was vicious and mean. "Mississippi was a long way from Hawai'i and I had never witnessed such anger and hostility as the local whites had for the incoming 'Freedom Riders' as we were called." "Was I scared? ... You bet I was". Carl looked at me with disbelief that I would ask such a dumb question, having lived with Jim Crow most of my life. "I believe everyone was scared." "Freedom Summer" activists faced threats and harassment throughout the duration, from white supremacist groups and local residents and police. During that summer 37 black churches and 30 black homes and businesses were firebombed or burned. More than 1,000 black and white volunteers were arrested, and at least 80 were brutally beaten by white mobs or racist police officers. "The white students from the north had checks sent to them from their parents. However, the banks would not cash them. Therefore a middle man was needed. The white students would have the checks endorsed to COFO and I would go to the bank to cash them. The white bankers did not suspect that a Chinese would be a part of the movement. Their only thought of a Chinese was what they saw in the movies of Charlie Chan or the corner laundry. So I quickly became the money changer. As much as I wanted to teach in the Freedom Schools, it was my task to handle the check cashing." "As small as the town was, how could they have not known who I was? Carl and I laughed at the sheer absurdly of racism. Carl completed his summer in Mississippi and did a tour in the Peace Corp in Uttar Pradesh, northern India, assisting chicken farmers. Like most able bodied men in the 60's he went into the Army and served as a medic specialist in Vietnam. "His time in the south and Vietnam radicalized him, recalled his sister Jade Young of Honolulu. Carl had great compassion for everyone. He learned every language where he spent time; Hindi in India, Chamorro in Guam, the various Native Languages in Micronesia, plus French and Hawaiian and some Vietnamese. Once back at home in Hawaii, Carl put his full being into The Hawaiian Sovereignty movement. Carl stood out as the rare ethnic Chinese in the movement, and rarely called attention to himself. "Later in life, Carl received his Hawaiian name, "Imiola," Jade told me. "Imiola" means to seek life, to seek truth, to explore and be one with profound knowledge." Carl, the most unordinary ordinary person I have ever had the gift of friendship. He was not a flashy guy. He didn't drive a fine automobile. In fact, he rode the fifty miles from Honolulu to Waianae on a moped to teach high school. He did not own a tie. I only remember him wearing long pants when we were in Geneva Switzerland at the United Nations Indigenous Peoples Conference. However, Carl's daily life made a lasting impact on everyone he knew. Due to the inattentiveness to Carl, he allowed the pancreatic cancer to take hold. He decided against the traditional surgery, choosing instead to live a quality life with as much laughter and joy before accepting the services of hospice. Carl's sister, Jade Young, is a hospice minister. "Historical racism and its attendant historical trauma tie together the 400-year old struggle of Blacks in America with the century-long struggle of Hawaiians in Hawai'i. The pain from this "post-traumatic stress 'disorder'", this historic trauma of slavery and colonialism, has brought about a deep anger and hostility that today threatens gains of the past. However, as we come to grips with what our genuine 'deep culture' is and as we retrace and rediscover our roots, the foundation is laid for real change, revolutionary change." The day we scattered Carl's ashes at sea, the rolling ocean waves turned from crystal clear aquamarine blue to deep indigo. The tradewinds gently pushed the boat forward until we could barely see the coastline. Several spinner dolphins came from every direction surrounded that boat, formed a circle and stayed with us for the entire ceremony. It was perfect. We need to take inspiration from Imiola to challenge us to overlook our differences. There must be a way to help re-create the Beloved Community that he was blessed to know, if only for a moment, in the Civil Rights Movement of the 60's. 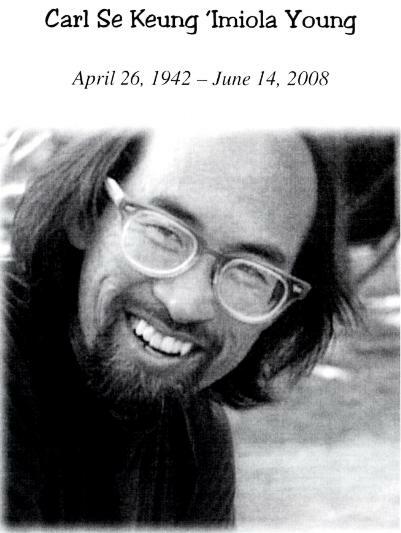 Thank you my friend, my hero, Carl Se-Keung 'Imiola' Young for your help in making this day in history possible. May you rest forever in my memory!